Californian Chardonnay is big, bold, typically tropical, and overly oaked. Right? Well, not always. Though many Californian Chardonnays (and especially the more expensive ones) do indeed lean towards this somewhat aggressive style, and though it’s true that much of this is due to the State’s relentlessly hot climate, there are exceptions to the rule. The most pronounced are those that hail from the Russian River Valley, the coolest of Sonoma County’s many distinguished AVAs (or appellations, for those whose wine speak descends from the French). While I have tasted spectacularly restrained Zinfandels from Russian River, the region is best known for its Chardonnays and Pinot Noirs, grapes that typically reach their apotheosis in the cooler climes of Burgundy. 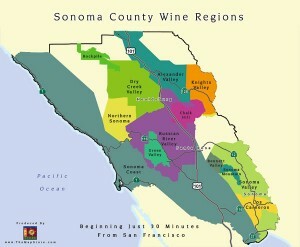 Finding a good online map of Sonoma County is harder than I thought. Russian River Valley is in purple up above, though your best bet might be to look at Dutton Goldfield’s map at its own web site. The RRV can be broken down into five distinct sub-regions, but there are certain common characteristics to them all. According to wine-makers Steve Dutton and Dan Goldfield, “What makes this (Russian River) appellation perfect for cool climate grapes is the daily interplay between marine air, coastal hills, and warmer protected valleys.” This is best exemplified by the common appearance of morning fog. Though fog is not necessarily a wine-maker’s best friend (it can cause botyritis among other fungal diseases), in Russian River Valley it does signify a positive cooling effect from the nearby Pacific Ocean that prevents grapes from reaching the same high alcohol levels as elsewhere in Sonoma and Napa. I’ve been fortunate enough to taste a number of fine Russian River Valley wines at various industry tastings, and occasionally felt flush enough to buy them at the store as well. Such an opportunity recently came up when I spotted the Dutton Goldfield Chardonnay Dutton Ranch, Russian River Valley 2007 at around the $25 mark. A blend of grapes from five of the coolest of RRV Vineyards, it was a pleasant yellow/light gold in the glass (as opposed to the sometimes glistening gold of the tropical styles), and emitted a pleasantly restrained nose of pears and apples, peaches and cream. But it was on the palate that it really impressed, offering restraint and subtlety, refinement and complexity, yet not at the expense of fruit (I tasted melons and apricots in there too) or depth (the wine positively danced around the tongue and had a delightfully lengthy finish. I’ve seen some talk of this wine as being “rich” and “full-bodied” but I disagree; in my glass, the Dutton Ranch had that quiet, dare-I-call-it-feminine self-assurance, the knowledge that it was beautiful and that it had no need to boast about it. In other words, it was a ringer for a great Burgundy. I’m not, sadly, enough of an expert to know for certain which Burgundy appellation I would compare to this too, but instinctively it reminded me of those that I hold in the very highest of regard: Montrachet and Meursault from the Côte de Beaune. And though a comparative taste test might reveal that impression as false, the mere fact that it set me thinking of the world’s finest Chardonnays has to be testament to the Dutton Ranch’s impressively French balance of finesse and fruit. Dutton-Goldfield also makes a single vineyard Chardonnay from its Rued Vineyard, priced at $45. By the description offered at the winery’s web site, it appears to be bolder and fatter in style – perhaps more in the more “typical” Californian tradition. Me, I’ll stick to the Dutton Ranch, as good a value as you’ll find in fine Californian Chardonnay. Search around and you can still come across the 2007 vintage for $25 and change. Stay in one night when you and a friend might otherwise have gone out and spend that same amount on three crap glasses of industrial chardonnay at a bar (not counting tip), and serve it as aperitif or with relatively light food that won’t overpower the wine’s own subtleties and you’ll taste what I’m talking about. You can thank me – or rather, Steve and Dan – later. Cheers. Hi, and thank you for the useful info . Keep me posted through email when you have new posts.